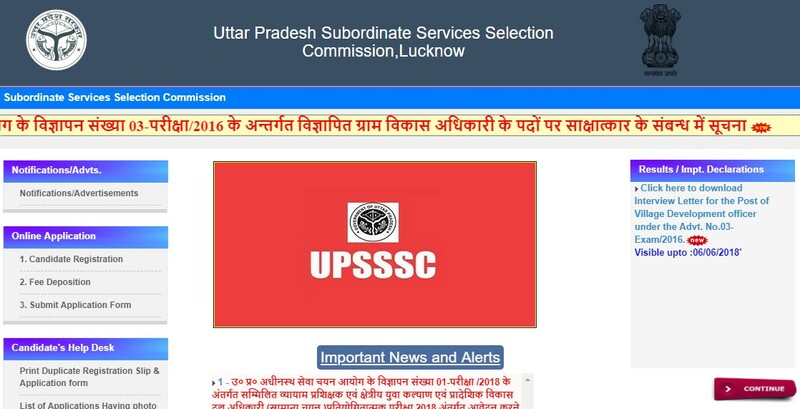 UPSSSC recruitment 2018: For the youth welfare and regional development team officer posts, the Uttar Pradesh Subordinate Service Selection Commission (UPSSSC) has released a notification today on 13th March to fill 652 vacancies. Interested candidates can apply for this posts through the online official website. According to the notification, the online registration for the posts which said has begun on March 13, Tuesday. But, the candidates can pay their fees from 15th March, Thursday onwards. In the 652 posts, there are 42 vacancies which all available for physical education instructors. Online registration started from 13 March 2018 and registration ends on 17 March 2018. The online submission of application fee will begin from 15 March to 19 April 2018. The application should submit before 23rd April 2018. The Regional youth development officer salary: It will be between Rs 29,200 and 11,2400. For the gym instructor posts, the pay scale is Rs 35400-112400. Eligibility: Candidate should complete his/her graduate degree from a recognised university or institute in India. Also, the physical education instructor must have D.P.Ed./ B.P.Ed. degree in physical education from the recognized university. Age Limit: It should be between 21 years (as low) and 40 years (higher limit). Five years of age relaxation for reserved category. 2. Candidates would need to register themselves. 3. Click on the ‘Notification section’ in the home game of the official website. 4. Click on ‘Apply’ after reading the entire notification. 5. Complete the application form by filling the required details such as name, education profile. 6. Now, the candidates would need to submit application fee. 7. After two days of submitting the application fee online. Candidates would need to ‘Submit application form’. 8. Upload your photograph and signature on the application form.